Prior to their game against the Tampa Bay Rays next Saturday, May 18, the Orioles will host an exclusive fundraising event for Shannon's Fund, an endowment at the University of Maryland Medical Center that provides financial assistance to hospital patients in need. For $50, fans will receive a left field lower box game ticket and enjoy a pre-game party on the Roof Deck that will include visits from BRADY ANDERSON, MIKE BORDICK, DAVE JOHNSON, a current Orioles player and other former Orioles. The deadline to purchase tickets for this event has been extended to Tuesday, May 14. The Oriole Bird will also pose for photos with fans attending the event, which will take place from 1:45-3:30 p.m. Light refreshments, including two complimentary drink tickets, will be included, along with an Orioles gift bag for each guest. 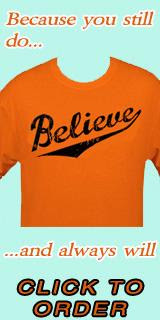 Tickets for the Shannon's Fund event are available at www.orioles.com/shannonsfund. The Orioles' game against the Rays will begin at 4:05 p.m.